Kathryn Staublin is a writer, editor, and English teacher from Indianapolis, Indiana. In 2017, she graduated from IUPUI with a master's degree in English, a certificate in teaching writing, and a certificate in professional editing. She encourages her students to write every day, if only for the sake of writing. 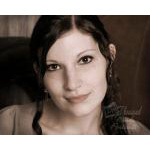 Her work has most recently appeared or is forth coming in Write City Magazine, Montana Mouthful, and The Horror Zine's Book of Ghost Stories.